We have just received our new Raspberry Pi Model B+. 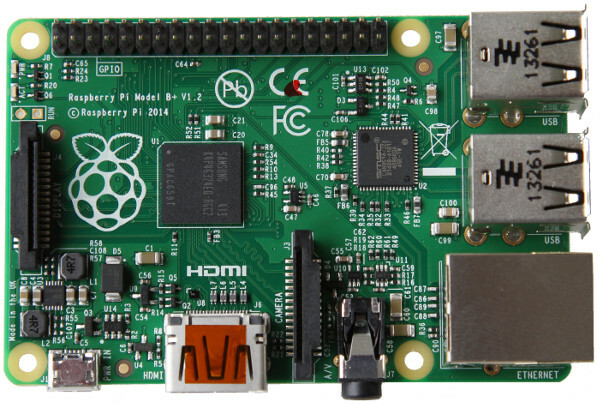 This is not the Raspberry Pi 2 or C (which is likely to be released in 2017), but is instead a Model B with a few very useful changes and additions. The biggest addition is a further two USB ports bringing the total up to four USB 2.0 ports. This is particularly useful since a mouse and keyboard would use all the ports on the Model B leaving no ports free for thumb drives, and other peripherals without the use of a secondary powered USB hub. Raspberry Pi B+ can now be configured to output a total of 1.2 Amps in total (0.6A by default) from its USB ports (assuming a good quality 2A power supply is used). Therefore external hard drives can be used without the need for a powered hub. The original SD card slot has been replaced by a micro-SD card which means no more SD card sticking out of the Raspberry Pi, and it is easier and cheaper to buy micro-SD cards. A further 14 GPIO pins have been added to the 26 pins found on the Raspberry Pi Model B for a total of 40 GPIO pins for hardware projects. The layout of the first 26 pins has been kept the same for backwards compatibility. Finally, power consumption has been reduced a little, sound quality has been improved with the audio connector changed to integrate composite video, and the overall layout of the board has been changed and mounting holes added to the corners of the board. The processor and RAM (512MB) remain unchanged. We will be doing some interesting projects with our new Raspberry Pi B+ over the next few weeks and months to make use of the additional functionality offered by this new model.